We would like to offer the opportunity for any NQTs in your school to attend a half-day conference to support them within their vital NQT year. This conference will be held at the University of Reading, London Road Campus and is available for any NQT who graduated during 2013. Alongside opportunities for professional contacts with their peers, the conference will provide subject-specific workshops as well as addressing themes such as behaviour management, transition and transfer or working with parents, and exploring the implications of the 2014 National Curriculum. NQTs can also choose to visit MERL (The Museum of English Rural Life), the National Centre for Language and Literacy or find out about the support offered by pfeg, the Personal Finance Education Group. Please see the accompanying flier for further details of the conference, including how to register. The cost of the conference is £30, including a light lunch. 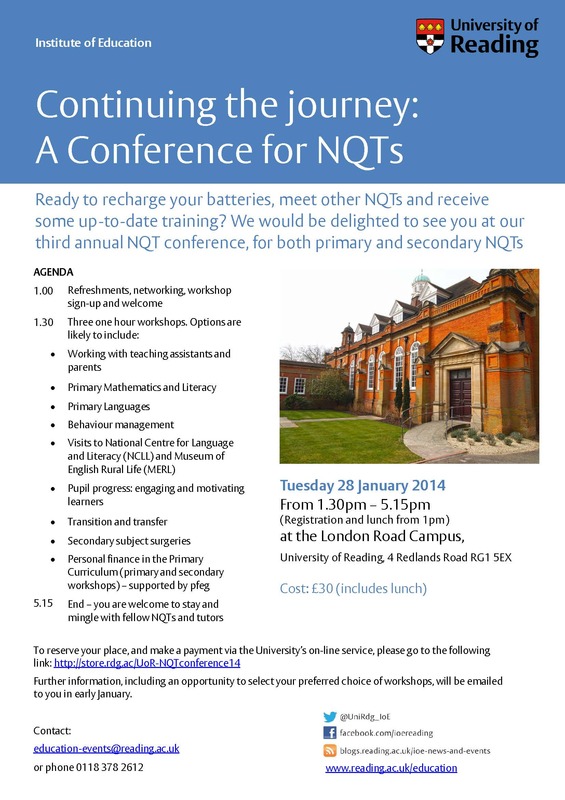 We hope you will be able to support your NQT in attending this conference.